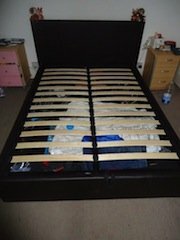 House Clearance Eyemouth: Hi I have to clear a 4 bedroom house in Eyemouth. Do you operate in that area? The move takes place Wednesday 17th September – Pickfords are arriving at 9.00 am and will be out by midday. My parents are downsizing considerably and it is the remaining items that require clearance. I see no reason why you cannot arrive at 9.00 a.m. at the same time as Pickfords. I will be travelling up from London the night before and I need to clear the lot by afternoon of 17th September. If all of the above fits in with you, and you can definitely attend the above day – I would be happy to engage your services and will give you the address and my mobile etc – could you also supply your mobile number? 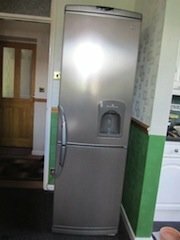 A space grey tall standing LG, two door fridge freezer, with built in water and ice dispenser. 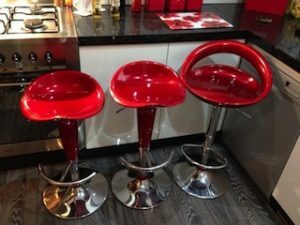 A set of three red gloss swivel bar stools, each on a chrome base with foot pedals. 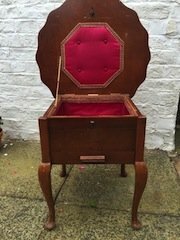 A vintage 1950’s mahogany sewing box on four legs, lined to the inside with red silk. 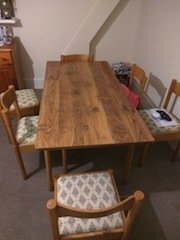 A rectangular oak dining table and six matching dining chairs, upholstered to the seats in duck egg and white patterned fabric. 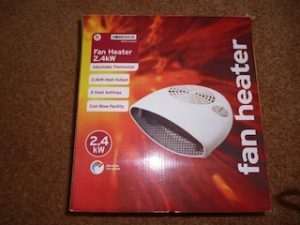 A white 2.4KW electric fan heater. 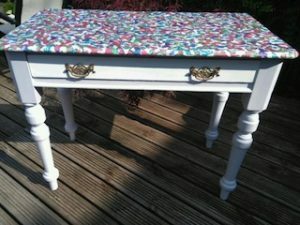 A solid wood hand painted white dressing table, having one drawer with ornate brass handles. 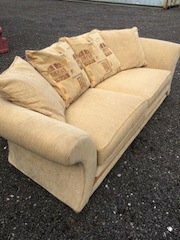 A two seater low back sofa on castors, upholstered in cream canvas fabric, complete with four matching cushions. 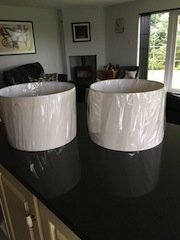 A pair of brand new 16inch cream lampshades. A white Swan 1400 spin, under counter washing machine. 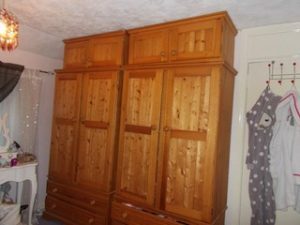 A pair of solid pine double wardrobes, each having a removable storage cupboard above and two drawers underneath. A tall standing brass two light floor lamp. 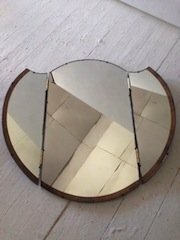 An art deco walnut framed tri folding vanity dresser mirror. 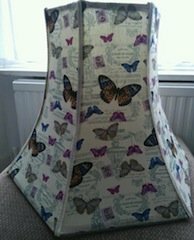 A large hexagonal butterfly and script patterned lampshade. 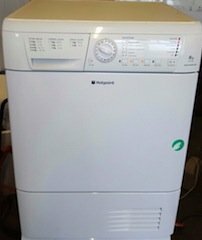 A white Hotpoint 8kg load condenser dryer. A black faux leather double storage bed on castors. 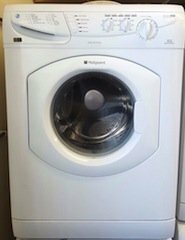 A white Hotpoint 1200 spin washing machine.